As breathtaking as a city skyline can be, it’s easy to find yourself missing greener landscapes in the view from your window. But there’s no reason for you to sacrifice the convenience and pace of living in an urban area – you can bring some natural beauty right to your home! A popular trend among city-dwellers, urban gardening is a great way to green up your space without leaving the concrete jungle you know and love. And when you go about it the right way, you can have a whole other kind of wilderness to return to every day! So, if you call somewhere like our Triad region home, you might benefit from a few of our best urban gardening tips. You probably heard something similar when you were first hunting for that perfect apartment, or the conveniently located townhouse. And it’s as true when it comes to your gardening plans as it was when you were looking for a place to live. Depending on what kind of space you have to work with, your urban garden is going to have to grow around your daily routine. So scope out your patio or balcony, but also consider keeping some of your plants indoors for a little glimpse of the natural world while you eat dinner, vacuum, or chill out with your favorite movie playing in the background. There is one thing to be said for urban gardening that can’t always be applied to a traditional backyard setup; the world (or your apartment) is your playground. Depending on what plants you choose, you can make almost anything a container. Plus, you can get creative in terms of saving space by going vertical or hanging planters and baskets along balcony railings. Just check with your landlord or management company and get the all-clear first! If you’ve never tested out your green thumb before, this pointer is especially important! Not all plants like to grow in limited space, or indoors, and some require more maintenance than others. So, before you make any decisions about what you’re going to have growing in your urban oasis, we recommend hitting the books (or the internet). 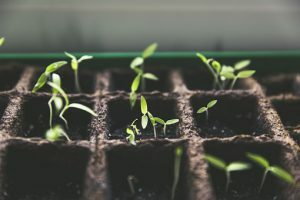 Living in an urban area often requires compromise, but with a little creativity, you can still indulge in your favorite outdoor pastimes, like gardening. This spring, bring some color back into your life by embracing an urban gardening method that fits your home and lifestyle! And for more tips on living green, no matter where you put your feet up, stay tuned to Carolina Fibre’s blog.